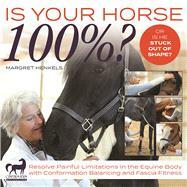 In this highly illustrated guidebook, professional equine bodywork practitioner Margret Henkel introduces readers to the internet” of the horse’s fascia or myofascia connective tissuethe gossamer, elusive tissue that organizes horse and human bodiesdetailing how horses can literally be transformed with simple hand contact by riders, owners, or horsecare professionals. Tour the horse’s fascia, from nose to tail, as Henkel discusses the secrets of conformation and how the horse fits together. Discover how the Still Point” releases horses psychologically from old stuck trauma memories held in their fascia cells. This new tool for advancing your horse’s body health, as well as dissolving mental trauma and restoring his emotional balance, can help soften the poll, connect with the mouth, restore elasticity to the pelvis, open the shoulders, achieve optimal freedom of movement, form a stronger partnership, clarify communication, and extend years of health and performance. Conformation Balancing is a new frontier in equine bodywork; its results are vast, progressive and lasting. Margret Henkel rode as a child in Pennsylvania and bought her first horse in college. In 2003, she rode the Connemara Trail and Coast Trail in Ireland. She studies dressage and enjoys trail riding in open country. Margret’s education is a BA in Journalism and her work experiences include the newspaper industry, owning an art gallery and fine art. A desire to completely heal long-term personal injuries introduced Margret to Heller Work and structural integration. When her old compensation patterns were resolved with her first Heller series, she was inspired to enter the bodywork field. Margret has also been certified with Matrix Energetics, a Quantum Energy work developed by Dr. Richard Bartlett. A certified Equine Natural Movement practitioner (Equine Natural Movement was developed by Joseph Freeman, out of Heller Work for humans), Margret offers experience in helping horses or all kinds, ages and disciplines. Each bodywork practitioner develops a unique approach to work; Margret’s work has incorporated Structural Integration (Heller Work), Myofascial Release (a technique adapted for horses with their high sensitivity), Cranio sacral releases, and inclusion of the horse’s soma emotional recall to further freedom for the horse. Currently a resident of New Mexico, Margret is available for out-of-state and work abroad.